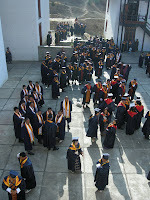 Thimphu Primary School graduated their first batch of students this morning. 21 children who had recently appeared for their first board exams received certificates from their principal, Ma’am Carolyn Tshering. In her final speech to her outgoing students, Ma’am Carolyn urged them to never forget the all-important values of respect, honesty and pride that their school had taught them. I’m reproducing her speech below to share her timeless message with students, teachers and parents throughout our country. This week’s banner celebrates primary education in Bhutan. Ladies and Gentlemen welcome to our first ever Graduation . In most western countries it is normally college and university students who enjoy a graduation ceremony, but in America they hold graduations for pre-primary students, primary, middle school etc. In this case I don’t see anything wrong in following an American custom.!! This morning’s function is all about class VI. I advised them to talk about what school has meant to them and what they have learnt about life, over the past six years of their education. I asked them not to talk about any particular teacher but to thank everyone and most importantly to thank you the parents. What they are about to say are their own words. Most have not shown their parents. I have watched with pride, some of class VI students from KG to VI (Pema Lexzim, Galek, Tobden, Tenpa, Yiga, Selden, Jitseun Pema and Tseki. ) change from adorable wide eyed children, thirsty for knowledge grow into mature, thoughtful eleven year olds. Respect for your parents, family, teachers and every human you meet. I hope you will show as much respect to a school bus driver or your home help as you do to your parents. They are all human beings, with equal feelings. Honesty and integrity – without these you will have no true friends. Money does not always bring happiness – it an help, but true happiness is being blessed with good health, a loving family and true friends. Remember your friends in class VI. Keep in touch with each other. Do not be swayed by peer pressure . You will be entering schools where many students are much older than you. When someone (or a group) try to persuade you into saying or doing something you are not sure about, question yourself. Is this what I have been taught? Is this right? Is this what my parents would want me to do? Be strong. Stick to your convictions. Pride – for your family, for your school, for your country and equally important for yourself and what you are trying to accomplish and what you have accomplished. Hold your head up high, think positively. Finally I hope you will all continue to love your amazing environment and educate those around you to preserve what we still have in Bhutan. Have a dream. If you don’t have a dream, your dream will never come true. Thank you for giving me the privilege of teaching you. “My duty is to worry every single day about our people and country. And to voice these worries frankly so that we do not get carried away, get caught unawares, or become complacent” commanded His Majesty the King to the teacher graduates during their convocation on 17th February (read full text). His Majesty then articulated his concerns about our education system with the clarity, earnestness and sense of urgency that comes from “worrying every single day”. Does our education system reflect our changing opportunities and challenges? Contemplate this question. Our hopes and aspirations as a nation must be reflected in what is taught to our future generations in the classroom. We must ensure that … young little hands grow to become strong and worthy of carrying our nation to greater heights. It is the duty of parents, policy makers and the government to put the right tools in their hands – the right books, the right curriculum, the right direction. We must first ask ourselves … what is the Vision for Bhutan? Then we must build an education system that nurtures people with the right skills, knowledge and training to fulfill this Vision. The sooner we realize this, the better. Our nation’s vision can only be fulfilled if the scope of our dreams and aspirations are matched by the reality of our commitment to nurturing our future citizens. If our Vision for the nation is not contained in the pages of the books that our young children hold, in the words of our teachers … and in the education policies of our governments, then let it be said – we have no Vision. While we pile dream upon dream like floors on a skyscraper, the foundation needs to be strengthened. Mathematics is one of our main weaknesses. We have similar weaknesses in Science and amazingly, even English. A nation’s future will mirror the quality of her youth – a nation cannot fool herself into thinking of a bright future when she has not invested wisely in her children. It is not enough to provide free education – we must provide education of such quality that it will guarantee a distinguished place for our youth anywhere in the world. Do not … let the light of education ever go out.